After the tea-ramisu was gobbled up at my aunt’s luncheon, she was kind enough to take us to a local gourmet grocery store on the way back home, Barbur World Foods. This place is a gem, specializing in Middle Eastern foods, but also stocking a range of organic and natural foods. All sorts of fun ingredients kept leaping spontaneously into my basket—phyllo dough, mesquite flour, bulgar, moghrabieh, unsalted shelled pistachios—and I had to stuff my hands in my pockets to keep from buying more than I could justify when I got back home. 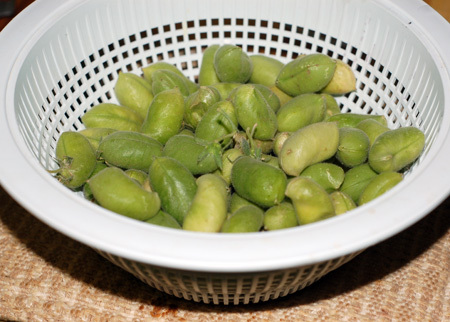 Among the treasures I couldn’t part with was a bag of green garbanzo beans, such a rarity around here that I’d never seen them in real life before. I snapped them up and did some online research after the fact. 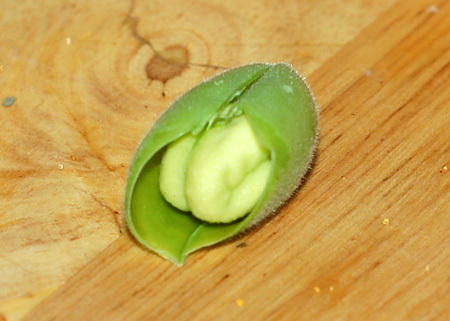 The general consensus seemed to be that green garbanzos should be eaten raw (in which state they look like tiny green brains and taste like fresh peas) or simply steamed or roasted in their shells with salt, akin to edamame. I chose a minimalist pan-roasting recipe, and whipped up a chicken dish that made use of both my prosciutto from Barbur and my leftover homemade mascarpone cheese from the tea-ramisu. This chicken is butterflied for a quicker cook time, and sauteed with a wrapper of crispy prosciutto. The sauce has only a few ingredients but packs a huge flavor punch. Season butterflied chicken breasts on each side with 1/4 tsp Italian herbs and pepper; place a slice of prosciutto on each side. (You don’t need to season with salt thanks to the prosciutto.) Saute in a hot skillet with olive oil until nicely browned on both sides and cooked through; if necessary, finish in the oven at 400F, or covered on the stovetop at med low. Remove from skillet and cover. Deglaze skillet with white wine. While it reduces by half, add sundried tomatoes, remaining herbs and mascarpone or cream. 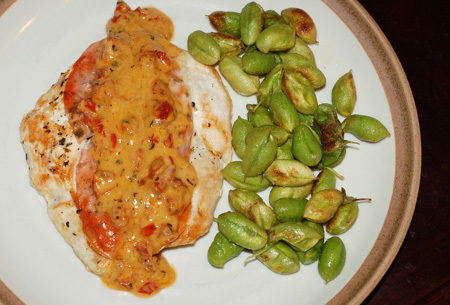 Taste and adjust seasonings if necessary; spoon over chicken breasts and serve with pan-roasted green garbanzo beans.